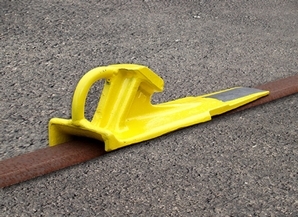 Tamper-proof chock for freight cars, or idling locomotives on flat track. Low clearance (4 in. above top of rail). Lip on one side of skid is removed for seating on flush rail. Roll car onto skid and apply brake. Chock other end of car with a conventional wheel chock. Skids are furnished as either "left rail" or "right rail" as viewed from the handle end of the skid.